After the excesses of Christmas, midway between the joyous fervour of well intentioned resolutions and the pay cheque that will once again allow you off the wagon, January can often seem to be the longest of months. What better way to shake off the malaise than by maintaining the level of decadence to which one has recently grown so accustomed? I cannot say for certain if this was the logic behind Ben Stephenson's latest brainchild, but there can be no denying the degree of Bacchanalian decadence involved in his recent Eight For Eight dinner. Eight people invited to dinner at eight o'clock; a BYOB party with a difference. A half bottle of Château d'Yquem 1955, bought at auction some years earlier, was Ben's inspiration for the affair: his desire to share it with an appreciative and passionate group of people did the rest. The d'Yquem alone demanded something noteworthy to accompany it and, once the notion of asking everyone else to bring a similarly spectacular bottle or two had taken hold, a suitably grand venue was also required. Manchester House, Aiden Byrne's recently opened city restaurant that is squarely aiming to bring Michelin's stellar glory to the city centre, was the perfect setting. That afternoon, Aiden and his brigade had created a bespoke menu for us to show both the dishes and our wines to their best advantage. This was certainly no mean feat, and I would very much like to thank Aiden and his team, both in the kitchen and in the front of house, for all of their efforts and for the care they took in looking after us. This is what we ate and drank. It was difficult to determine the colour in the dimly lit bar, but this displayed a lovely, delicate bead. Sweet, toasted, slightly charred brioche nose, with a hint of bruised apple fruit. Smokey, rich and honeyed, there was a nutty, faintly oxidised quality that spoke of maturity. The palate was dry, fresh and upright, with ripe apple fruit, a nice smokey and mineral streak, pithy lemon citrus fruit and a soft, elegant mousse. As with the nose, there was a gently drying, nutty, oxidised element to the palate. The fresh, hugely complex, finish had apple fruit and a buttery, charred brioche character. Excellent length and absolutely à point, this would probably keep another couple of years but it is unlikely to get any better than this. Slightly coarser bead than the Heidsieck, but nothing to worry about. A somewhat reticent nose offered a hint of strawberry fruit, but little else initially. The palate was dry, rich, elegant and delicate. Smokey, strawberry and raspberry fruit, subtle autolytic flavours and a smooth, soft mousse. Youthful and fresh, with a long and bright smokey, berry finish. I don't know if it suffered in direct comparison with the Blanc Des Millenaires, but I felt this was a little simple and I wondered if it was in an awkward, adolescent phase of its evolution. It did open up somewhat in the glass and it certainly wasn't too old or faulty; maybe more time in the bottle will help. Lovely but not amazing, I must admit to being rather disappointed that this did not live up to my expectations. The evening's raison d'être, it was apparent from the beautiful burnished amber colour seen through the glass of the bottle that this was still in fine condition. The rich, vibrant nose was high toned and redolent of both butterscotch and burnt toffee. Mature certainly, but far from past its best. 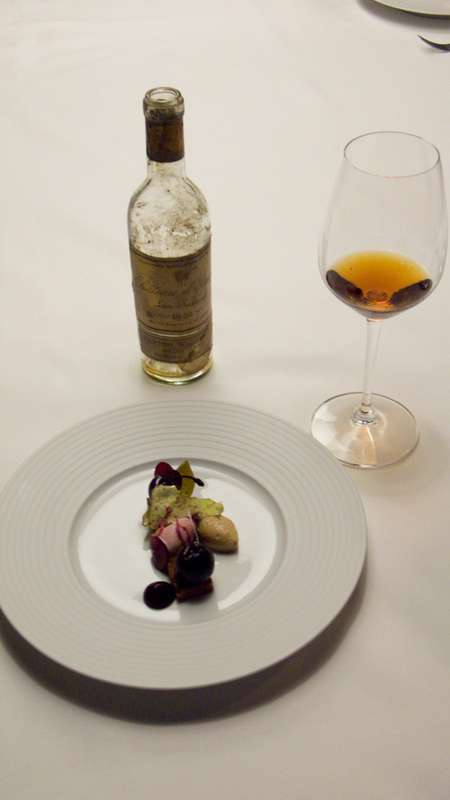 The palate's sweetness was balanced by firm acidity and by notes of quince and marmalade from the botrytis. Vibrant, lively and hardly dimmed by age. Butterscotch and piercing burnt toffee flavours reappeared on the long, long finish. An excellent and extremely rare treat and a genuine privilege to taste a wine of this calibre. Serving the D'Yquem in the French fashion at the start of the meal meant that foie gras was the only logical choice to accompany it. This was probably Aiden's most complex and technically challenging dish and I understood his train of thought in creating it. Despite its flawless execution, I'm sorry to say that for me this was not an entirely successful dish. I liked the idea of lightening the foie gras by making it into a mousse and the gingerbread spicing paired with it well. Unfortunately, the sweetness of the palm sugar, of the pain d'épices and of the cherry combined to overwhelm the savoury richness of the liver, and the intensity of the cherry flavour clashed somewhat with the toffee and quince notes of the wine. To be totally honest, I probably wouldn't have drunk such a wine with anything more elaborate than an unadulterated slice of a torchon of foie gras, but that's not really Aiden's style and I admire him for pulling out all of the stops and for rising both to the occasion and to the wine. Golden coloured, with only the barest indication of the darkening that comes with age. The nose was toasty, with lime fruit and a faint hint of kerosene. More savoury than sweet, I also noted darkly roasted nuts that headed towards the coffee or cocoa end of the aroma spectrum. Dry yet rich on the palate, toasty notes and a firm lime acidity were balanced by a drying, talc-like minerality and by the hint of roasted nuts/kernels from the nose. The finish was long and rich with a suggestion of sweetness to it, but was dry and minerally overall. This was starting to fade, yet for a thirty year old, half bottle of dry white wine it was still a fascinating and lovely drink. I'd recommend drinking this now, should you be fortunate enough to own some. A pungently kerosene-scented nose, with aromas of fresh lime juice and mango infused oolong tea, faintly toasty yet bright, fresh and still very youthful. Medium dry with firm balancing acidity and a smokey/slatey mineral spine, upright and beautifully structured. Slightly more tropical than citrus - mango, raspberry and chamomile rather than lime and peach - and a tannin-like mineral dryness. Full bodied, finely poised and hugely long. Not at all overly sweet and an amazing wine to pair with food. Prüm's wines are famed for ageing majestically and, after half an hour in a decanter, this was a triumph in the glass. Lovely now, but I'm sure that this will live to be at least twice it's current age. Somewhat to Aiden's disappointment, the dish that he declared to be the simplest on our menu turned out to be the favourite of several of our party, including me. Turbot and langoustines are two of my favourite ingredients; pairing them with two great examples of what might well be my favourite grape variety was always going to win my affection. Beautifully cooked and seasoned, the firm and savoury turbot was nigh on perfect; the truffled langoustine garnish was a joyous combination of sweetness from the crustacean, meatiness and earthiness from the stock and the fungus and a nutty, gently vegetal bitterness from the thistle. The Hugel was such a sublime match for the fish that the Prüm barely got a look in with this course. In fact, I actually saved the Spätlese until after the fish course when it made the finest palate cleanser imaginable! The pale orange/amber colour more resembled that of Tokaji than anything else and it was immediately obvious that this had had its day. A nose of golden-toasted white bread was haunted by a ghost of its former glory: the faintest suggestion of vanilla and citrus fruit. The palate was similarly oxidised and dried out. Interesting, but sad. Deep golden yellow with a faintly cheesy and roast chicken (autosuggestion?) nose, and gentle smokey/vanilla oak and lemon citrus aromas that carried through to the palate. The oak and lemon notes were joined by the toffee richness typical of mature oaked Chardonnay, all balanced by soft spice and fruity acidity that Ben impressively and accurately likened to rhubarb crumble. Long, but noticeably acidic on the finish. This was a wine that I had greatly enjoyed on a previous occasion and it was very pleasant here, although it was more mature than the previous bottle I had tasted and lamentably it seemed a little out of its depth in such illustrious company. Roast chicken is probably my desert island dish, and I was particularly interested to taste Aiden's take on the classic American backyard barbecue version. Open a can of beer, drink about a quarter of it and stand a whole chicken on the can by inserting the open end into the body cavity. Fire up some charcoal, stand the beer can impaled bird on the grate of your barbecue and close the lid. The beer steams the chicken from within whilst the charcoal roasts and smokes the bird from the outside. An irresistible combination. Aiden wasn't going to let the chicken off quite so lightly, however. He had replaced the beer with concentrated chicken stock and he had brined the bird to retain its moisture and to enhance its flavour. Needless to say, it was of the tastiest pieces of chicken I've eaten for a while. Purely for my taste the onion purée in the macaroni needed an element of bitterness and/or acidity to balance its rich sweetness, but the focus of this dish was the poultry and Aiden's chicken ruled the roost. Opaque purple/black in colour with long, long legs. Hotly alcoholic on the nose with oodles of ripe black fruits, sweet oak spice and creamy, darkly roasted coffee aromas from its 19 months spent in barriques. Dry, spicy and very youthful, there was also a substantial hit of alcohol on the palate, balanced by all of the depth and concentration the impenetrable colour implied and by an impressively solid structure. Violet, floral and orange zest notes mingled with bright, rich black fruits, liquorice and a liberal dusting of oak spice. Firm acidity and tannins balanced the ripe fruit and almost stood up to the alcohol, but not quite. Still very much a baby and, although this wasn't a style of wine I prefer, I don't have much experience of the wines of Castilla Y Leon and it would be interesting to revisit it in five or six years. Whereas the Quinta Sardonia had been decanted at 3.30pm, Ben had brought this along as a last minute addition to the bill and it had only been decanted when we sat down for dinner. A deep ruby colour with a garnet hue at the rim, the youthful nose displayed slightly tart red fruits, gentle herbal and floral aromas and a suggestion of sweet, earthy spice. Typically dry and austere, its youth was apparent in the tightness of its structure. Red berry fruit, clove spice and a note of cranberry tartness to the acidity, this was long, elegant and harmonious and pleasingly traditional in style. I suspect that this might have been more expressive after a further few hours in the decanter, especially being a magnum, but really it needed another five or six years in the bottle and it would easily have lasted twelve to fifteen years. My only fear for this dish was the level of gaminess of the hare; I have found the supposedly traditional pungency resulting from lengthy hanging to be something of a challenge when I have eaten it previously. I needn't have worried. Delicately gamey, the hare was cooked to an ideal medium rare and served with a simple garnish of earthy and bitter vegetables for a delicious goût de terroir. A very good dish indeed. Unfortunately, the dark and brooding Quinta Sardonia overwhelmed both me and the hare but the leaner, red fruited Barolo was just the ticket. From the now retitled Côtes de Castillon appellation, this garagiste project is the pride and joy of Pascal Lucin, the technical director of Château Grand Pontet. Farmed biodynamically since 2001, the grapes are still trodden by foot and the production of around 4800 bottles is not filtered. Predominantly Merlot, with Malbec, Carmenère, Cabernet Franc and Cabernet Sauvignon in the mix, the most unusual facet of this wine is the nature of the estate's Merlot vines. From a tiny 0.85ha plot, the ungrafted Merlot vines pre-date phylloxera and, at over 140 years old, they are reputed to be oldest in Bordeaux. Deep ruby in colour, mixed berry fruit and sweet baking spices pervaded the nose. Exotic, with a warming hint of alcohol, but lovely, rich and ripe. Rich berry fruit carried on into the palate, balanced by a gentle herbaceous quality and by a creamy-textured, coffee infused oak character. 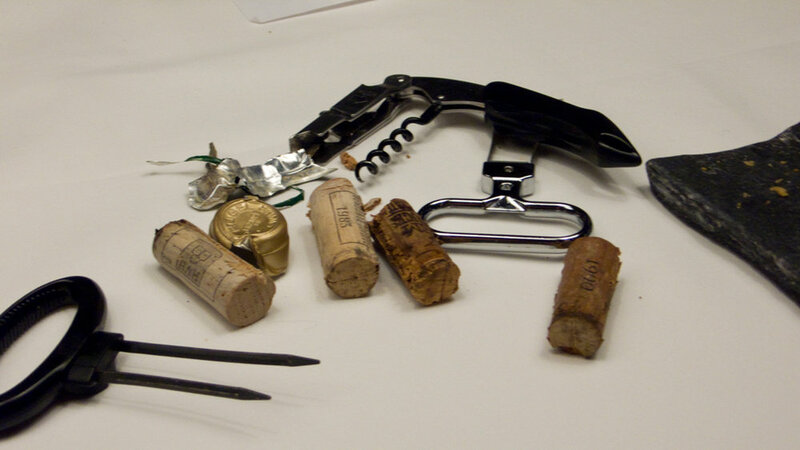 There was a pronounced intensity and a mineral quality that is unique to old, low yielding vines. Full bodied, moderately structured and very long, this was beautifully approachable now but it would certainly have kept for another three or four years with ease. Not massively complex, but delicious and distinctive and its story was fascinating. A medium, tawny-tinged garnet with barely noticeable legs. 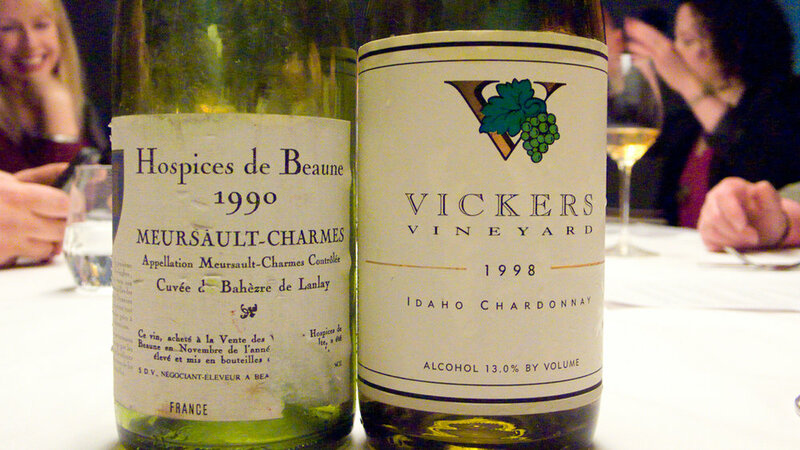 Mature, tertiary aromas defined the nose: leafy, meaty, smokey and enveloping. Dry, yet the fruit was still sweet and inviting. Earthy and herbaceous flavours, gentle smokey oaked spice, harmonious, complex and still very long. Medium bodied but ripe, the fruit was well balanced by the refined and once-typical Bordeaux tannic and acidic structure. The creamy, mixed berry, herbaceous finish was sweetly fruited, smokey and lasting, an absolute triumph. Delightful and still holding up well. Enjoy this over the next year or two, or make a profit on your good taste by consigning it to an auction before the bubble bursts on the 1982 vintage. If my by now befuddled brain can be relied upon for anything approaching an accurate recollection, our meat course resembled nothing less impressive than the rib joint of dinosaur served to Fred Flintstone in the opening sequence of his eponymous cartoon. Medium rare fillet and unctuous braised cheek were served alongside grilled ceps, cavolo nero, Neolithic-looking clay covered potatoes and calcium something-or-other somehow-or-other prepared salsify (befuddled, I told you). The horn filled with jus completed the backdrop to the beef spectacularly. Rich, savoury and immensely satisfying, even the clay covered potatoes brought a nostalgic smile to my face, reminding me of pottery lessons at school when a hastily grabbed sandwich during break mingled with the slip from my hands to strangely similar effect. What was not a surprise was how well both Bordeaux paired with the beef, and I kept alternating between the rich fruitiness of the Clos Louie and the aristocratic charm of the Château Talbot. How often do you have the chance to drink one wine from the 1950s, never mind two? Although I was beginning to flag, it would have been churlish to have thrown in the towel at this point. Pale garnet but unfortunately slightly hazy as this was called upon at short notice and had not had chance to settle properly. Faintly sweaty old leather on the nose, with tart red fruit and typical earthy and tarry aromas. The palate was dry and drying out somewhat - hardly surprising given its age - but it still delivered sweet red fruit, a tarry edge, mellowed tannins and now moderate acidity. Harmonious and elegant but fading gracefully; this must have been a formidable wine in its youth. Lovely but now rather old, it was a privilege nonetheless to have tasted this piece of Piemonte's wine heritage. This port made entirely from young vine Touriga Nacional was decanted at 3p.m. and was eventually served at 11.45p.m.. Deep and inky dark purple, with very long legs. Spirity, ripe and spicy on the nose, with pungent aromas of liquorice and fenugreek. Sweet, with a unique, Middle-Eastern spicy/herbaceous character and quite unlike any Port that I've tried before. Approachable but still very young, it would be interesting to see how this evolves over the next ten or more years. Lovely, but decidedly quirky. These wines were served alongside a square slate platter of about a dozen artisan cheeses arranged clockwise from the mildest to the most strongly flavoured, I'm sure that many of the pairings were excellent but I just couldn't eat anything else! And did I mention it was now 1a.m.?!? I have to thank everyone at Manchester House once again for a truly memorable dinner, and I must also thank all of my fellow diners for being such fine company and for sharing these treats from their cellars. Finally, a big thank you to Ben for including me on his guest list for such an exceptional event and for his generosity with his wines.